Awesome! We have received your information and we will reach out to you as quickly as we can. When you think about what the next generation of real estate in Montgomery County is going to look like our spotlight agent Lindsay Betz has to be a part of that vision. We are so excited she chose to get into the real estate business, and even more excited that she is a part of our Quinn & Wilson team! Enjoy this week’s Agent Spotlight where Lindsay shares some insight on her and her growing real estate career. 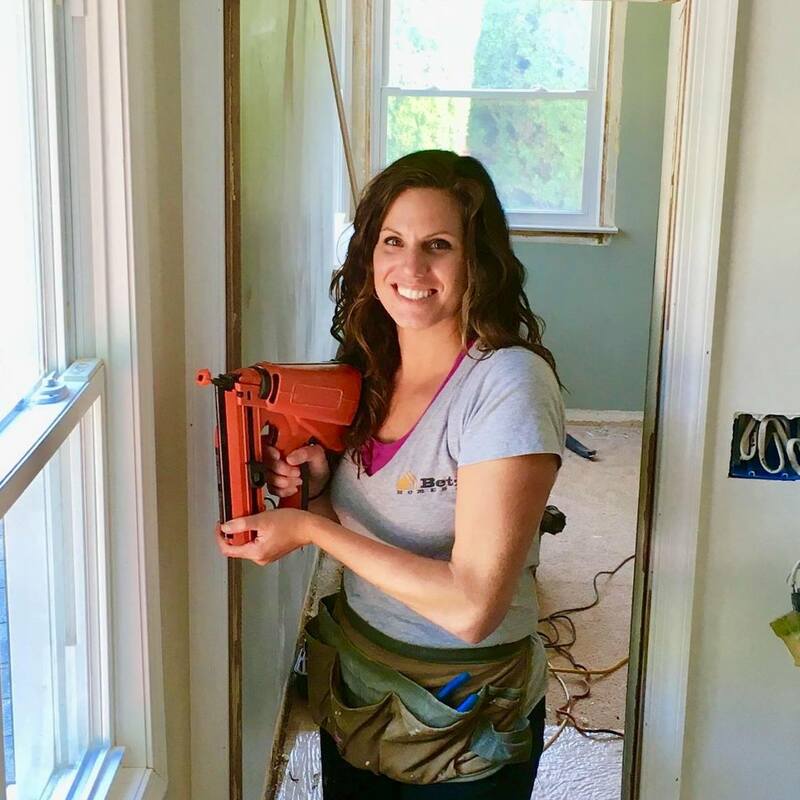 Lindsay is not just about selling houses…she fixes them too! Q – So Lindsay, let’ get to know you a bit. First and foremost as one of our newest additions (circa 2017) can you tell everyone what drew you to real estate as a career? L – I bought a house with my husband who is a general contractor and has been around houses his whole life. During the months-long process of buying and renovating I realized I really enjoyed residential construction and updating…and I also realized (thankfully) that we made a great team. Also, I loved the whole process and thought it would be a great way to help people in life. Q – Well it’s a good thing you decided he could be a good teammate! But your story is a great one, and different than how many people come to the business. Tell us how you got to Quinn & Wilson – after all everyone thinks younger agents don’t come to independent companies. L – That’s such a mistake on their part. Independent companies like Quinn & Wilson are the perfect place for people getting into the business to shine. In my case Buzz Wilson (one of the founders of Q&W) guided us through the purchase. He had a rich history with Betz Family Construction and quickly introduced me to the entire Quinn & Wilson team. I felt right at home and love being a part of this team every day. Q – Gotta love Buzz. Always finding the next generation of talent. Now that you’re set in your business and helping lots of people…what celebrity do you wish would walk through the door looking to buy a home? L – Jeff Bezos. Undoubtedly there is something entrepreneurial to learn from this guy, especially in a real estate transaction. And we certainly wouldn’t have to filter the search by list price. Q – Alright Lindsay Betz, fess up. What are three things that people don’t know about you? L – Ugh..first that I don’t like to tell people that sort of thing! Real answers 1) I’m currently learning to play the guitar; 2) I have RV’ed around the country several times and 3) I love to cook. Q – See…that wasn’t so hard! Great stuff. Now do you have a favorite architectural style? L – I love a charming Cape Cod. Thankfully this area has a bunch of them and I get to see new ones all the time. Q – You’re day can’t begin without _____ ? L – Checking the weather! How in the world would I know what to wear? Q – Smart. OK, let’s switch gears a bit. What do you do locally to engage with the community? L – So, I’m an avid mountain biker and I love to ride the trails in Pennypack and Lorimar Park. From that I have had the great opportunity to be an assistant coach of the Southern MontCo kids mountain biking team – such a tremendous group of kids, coaches and parents all working to make mountain biking into an interscholastic sport in this area. Q – Well that’s a great one, and certainly different than we hear from others. Good luck with the team! Less serious question…if you were stranded on a desert island what three things would you want to have with you? L- Oh, that’s easy. My husband (Dave), my dog (Lucy) and my surfboard. Hopefully this desert island has some good waves. Q – Almost sounds like a vacation. OK, last two questions. First, what is one piece of advice you would give a buyer or seller looking at today’s marketplace? L – For buyers, I would remind them that you can always change a house to some degree, but you can’t change the property or the location. Love those two things first, and then if you modify the property you’re building even more equity. Sellers…do the heavy lifting up front. Try to know what the issues are that might cause delay and remediate them before you get on the market. Q – Solid advice. Do you think there is one misconception the public has about real estate? L – Yes..and I hear it from friends; that you don’t need a real estate agent to buy a home. Let me tell you, there are quite a few contractual deadlines and challenging, emotional decisions that have to be made; I wouldn’t advise people to go-it-alone when a good agent will guide you through and help you make the best choice. Q – OK so we have learned a ton about you but there is one more thing that people should know. As someone who has been around this area for a while, what’s a great night out for you? L – Live music…I love live music. Beyond that, a great dinner is Blue Sage nearby.